Cobalt prices surged in 2017, and with interest in the critical metal still riding high, 2018 has so far been another strong year. The metal’s positive performance is being driven by excitement about electric vehicles. The lithium-ion batteries that power these cars require lithium, graphite and cobalt, among other components, and demand is expected to keep rising as the shift toward electric vehicles continues. Given those circumstances, it’s particularly interesting to look at top cobalt production by country. According to the latest US Geological Survey numbers, global supply decreased in 2017, falling slightly to 110,000 MT from 111,000 MT the previous year. Read on for a closer look at cobalt supply. The DRC is by far the world’s largest producer of cobalt, accounting for roughly 58 percent of global production. The country has been the top producer of the metal for some time, and its output remained the same from 2016 to 2017 at 64,000 MT. As demand for cobalt rises, increasing attention is being directed at the DRC. Cobalt mining in the country has been linked to human rights abuses — last year, Apple (NASDAQ:AAPL) temporarily stopped buying cobalt mined by hand in the DRC. In addition, Congress in the DRC recently passed a revised mining law that is set to increase taxes on cobalt and other metals; the news has left miners concerned about how they may be impacted, and could push cobalt prices even higher. Despite those challenges, the DRC is likely to remain key to the cobalt market for the foreseeable future. Russia’s cobalt production increased slightly in 2017, coming in at 5,600 MT compared to 5,500 MT the previous year. With concerns about DRC cobalt running high, some automakers are calling for increased electric vehicle battery production in Europe. It’s possible that this push could prompt higher cobalt demand from Russia in the future — the only question is whether the country will be able to keep up. While its cobalt reserves stand at 250,000 MT, Russia is still well behind the DRC in terms of production. Large Russian miner Nornickel (MCX:GMKN) produces cobalt, and is working to reduce stockpiled material this year. Australia saw another drop in cobalt production from 2016 to 2017, with output sinking from 5,500 MT to 5,000 MT. Like many other countries on this list, cobalt produced in Australia is a by-product of copper and nickel mining. The country’s nickel mines are located in the western part of the country, mostly around the Kalgoorlie-Leonara regions. As the DRC becomes increasingly challenging for miners, Australia is another country that’s receiving more attention as investors try to divert their interests away from Africa. Riding this wave of attention, Clean TeQ Holdings (ASX:CLQ,TSX:CLQ) raised an impressive AU$150 million in March 2018. Canada was the fourth-largest cobalt producer in the world in 2017, with output increasing marginally from the previous year. As with Australia, Canadian cobalt comes mostly from large nickel and copper mines that produce cobalt as a by-product of their normal operations. Some of these major nickel and copper deposits are Kidds Creek, Sudbury and Raglan. In the last couple of years, a number of junior miners have rushed to Cobalt, Ontario to stake land. The site is located near the Quebec border, and is known for producing large quantities of silver in the past. Now hopes are high that the area could be a cobalt hotspot. It’s still early days for many of these companies, but if they are successful it’s possible Canada’s cobalt production will rise in the coming years. 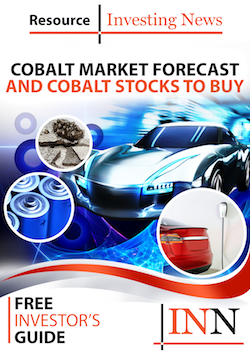 Cuban cobalt production remained the same year-on-year in 2017, at 4,200 MT. The country’s Moa region is home to a joint venture nickel-cobalt operation held by Canadian firm Sherritt International (TSX:S) and General Nickel Company of Cuba. Hurricane Irma ripped through the country in September 2017; luckily for Sherritt, the company reported minimal damage. Cubaniquel, the country’s state-owned nickel miner, has announced higher targets for cobalt for 2018. The Philippines is the sixth-largest cobalt producer in the world, putting out 100 MT less in 2017 than the year before. That is a small dip considering the country’s decision to shut down 28 various open-pit mines due to environmental concerns. The fate of mining in the Philippines is up in the air as President Rodrigo Duterte and Environment Secretary Roy Cimatu deliberate over a country-wide ban on open-pit mining. As of November 2017, Duterte “had rejected a recommendation by the Mining Industry Coordinating Council (MICC) to lift the ban,” according to Reuters. The president cited environmental degradation as his main concern. Madagascar’s cobalt production remained the same from 2016 to 2017. According to MBendi Information Services, the Ambatovy nickel-cobalt mine is the largest and most advanced mineral project in the country. It is located about 80 kilometers east of Antananarivo. Sherritt International used to own 40 percent of Ambatovy, which cost more than $5 billion to develop. Late in 2017, Sherritt transferred 28 percent of its stake in Ambatovy in order to reduce its debt load. It will retain 12-percent ownership in the mine, and will continue on as operator until 2024. Papua New Guinea is a newcomer to this year’s list of top cobalt production by country. The small country off the coast of Australia produced 3,200 MT of cobalt as a by-product of nickel production. The country’s main cobalt producer is the Ramu nickel mine near Madang. The mine is a joint venture between private company MCC Ramu NiCo (85 percent), Highlands Pacific (ASX:HIG) (8.56 percent) and the Papua New Guinea government (6.44 percent). In May 2018, Highlands signed a deal that will increase its ownership of Ramu to 11.3 percent and reached a C$145-million streaming agreement with Canada’s Cobalt 27 Capital (TSXV:KBLT). Zambia’s cobalt production fell 100 MT in 2017. It is the third-largest cobalt producer in Africa, and while many see a bright and fruitful future for the country, political uncertainty and power supply have posed obstacles in the growth of the country’s mining industry. Among other things, Zambia has rolled back royalties that were set in 2015, facing backlash from the mining sector. Amendments were made to lower rates to appease miners, but there is a lingering distrust of the government in the industry. New Caledonia’s cobalt production dropped last year, sinking from 3,390 MT in 2016 to 2,800 MT in 2017. A subsidiary of France’s Eramet (EPA:ERA) mines substantial deposits of oxidized ore (garnierites) at four mining centers located in the north and south parts of the country. The ore is processed at the company’s Doniambo smelter, which is the world’s largest ferronickel-producing plant. We were surprised to see that China didn’t make the list this year since it was the second-largest cobalt producer in 2016. We reached out to US Geological Survey and learned that China’s cobalt production numbers turned out to be much lower than originally noted in 2016. It is still a leading cobalt producer globally; however, it didn’t make it into the top 10 for 2017. Hi – It seems the numbers reported as baseline for 2014 in your 2015 production update article of this year don’t match the numbers reported last year in the 2014 production update. For example did DRC mined 63000 MT in 2014 (as reported in the 2015 update) or 56000 MT (as reported in the 2014 update)? Same thing with Zambia output in 2014: 5500 MT according to the 2015 update vs. 3100 MT according to the 2014 update; with Philippines output in 2014: 4600 MT according to the 2015 update vs. 3700 according to the 2014 update, etc. “Thank you for your inquiry about clarification of our cobalt mine production statistics for 2014. The Mineral Commodity Summaries (MCS) publication that you used as the source for the statistics is released at the beginning of each year and includes estimates for the prior year (e.g. the 2016 MCS has estimates for 2015). These estimates are made in the fall of the year being evaluated and at best are based on production for the first two or three quarters of the year. The numbers for earlier years listed are revised if reported data have become available or if information has become available to make better estimates. So, the 2016 MCS has mine production data for 2014 and 2015. The 2015 data were estimated and are likely to be revised in later publications. The 2014 data may have been revised from what we published in the 2015 MCS if we got new information. That was the case for the countries you mentioned (DRC, Zambia, and the Philippines). Norway produced 311t Mt of cobolt in 2015, making it no 9 on the list and pushing morocco to no 11.
correct number is 3117 Mt of cobolt from Norway in 2015, please correct. Do you know why the USGS didn’t include the numbers from Norway?